← Cook up some garlic scapes and escape the culinary ordinary! For those who love to grow garlic and for those who just love to eat it, harvest time can feel like the unique torture of an overlong summertime road trip. From the back of the station wagon, cries fill the air: “Are we there yet?” and “When are we going to get there?” These cries are often accompanied by calls like “I’m hungry!” and “I have to pee,” but for the purposes of this post we will stick to timing. Are we there yet? When is the best time to harvest garlic?! It’s a big question. Garlic essentially has three harvests: in the spring you can cut greens to use as scallions; in early summer, we harvest garlic scapes; late summer (right now!) is the main harvest—the garlic bulbs. Timing is everything. Wait too long, and your garlic will be overripe, its heads will not keep together, and it will not store well. Harvest too soon, the bulbs will be small, the wrapper may disintegrate, and your heads will not have had time to form properly—they will be usable and probably delicious, but you’ll enjoy greater rewards if you give them time for a bigger harvest of bigger bulbs. The secret to perfect timing is in the leaves. Our rule of thumb is when the lower half of the eight or nine leaves on the plant turn yellow, it’s time to harvest! As with most root vegetables, you wont know for sure if the time is exactly right until you dig one up. It’s always a good idea to pull some bulbs to check and see how far along they are. If the bulb is full and of good size it’s ready to pull. It is important to let the soil dry out a bit before harvesting. If it’s too wet, the garlic will not dry as well or as evenly as it should. A dry harvest will store longer and will not mold. We stop watering two weeks before we plan to harvest in order to start the drying process in the ground. After digging up the plant, we brush off as much soil as possible, and then put the bulbs in a warm, dry place to cure. To maximize space and save time, here at Green Mountain Garlic we cut off most of the stalks and the roots right away and place the bulbs on screens for drying. Traditionally 6-8 plants are tied together and hung to dry. Make sure your harvested garlic gets great air circulation! Don’t store them in a damp basement or root cellar. You’ve waited this long – store your bulbs well and you’ll be able to savor them for as long as possible. 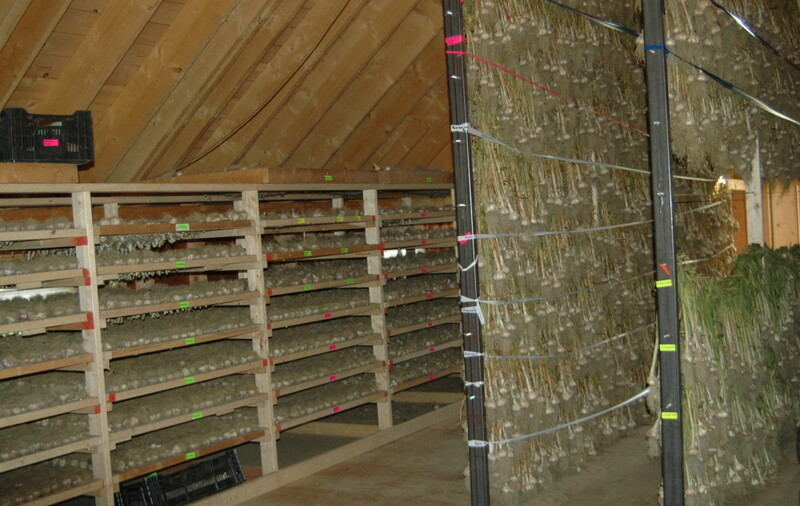 Softneck garlic, our longest storing garlic, will last up to 12 months if hung in a dry place. And Garlic braids are a beautiful way to keep (and show off) your harvest. The garlic looks amazing this year! We started with twelve varieties, including Chesnok Red, Georgian Crystal Garlic, German Extra Hardy, Italian Red, Music, and Silver White. Our customers have been clamoring for them—we’ve already sold out of a few varieties. Come visit our organic garlic farm at Twilight Farm on Kneeland Flats Road in Waterbury, Vermont. 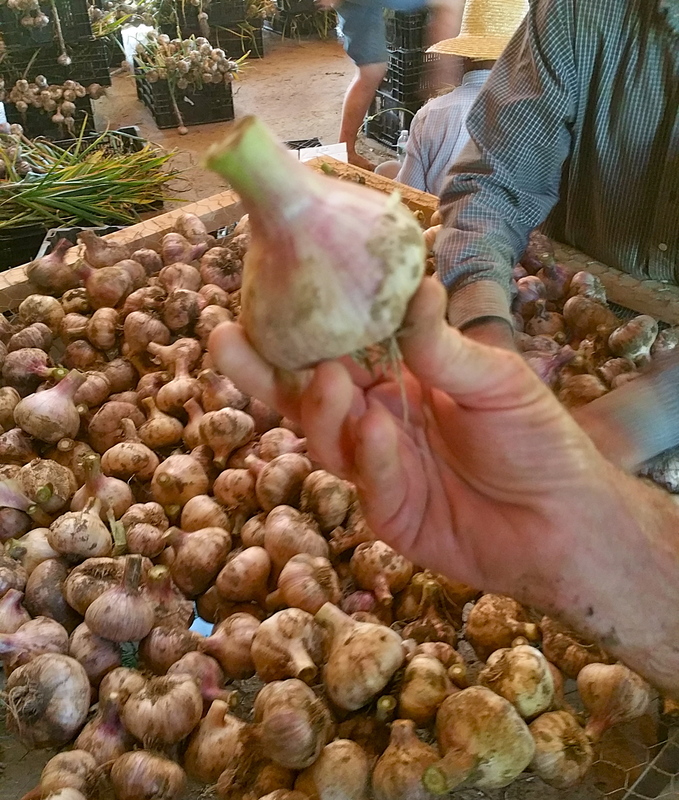 You can choose your favorite varieties of seed or food garlic to take home. We’re open 9-6 every day through October.